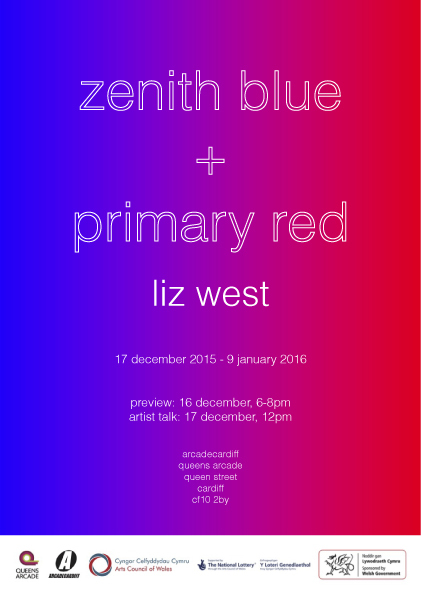 Arcadecardiff is delighted to present the first exhibition in Wales by Liz West. Comprising new light work made site-specifically, the exhibition Zenith Blue + Primary Red features a physical demonstration of colour mixing and optics which fills the space with radiant colour and luminous light for visitors to explore. West creates vivid environments that mix luminous colour and radiant light. Reacting to the architectural space of Arcadecardiff, West has created a site-specific installation work which has transformed the room into an immersive and sensory experience. West aims to provoke a heightened sensory awareness in the viewer through her works. She is interested in exploring how sensory phenomena can invoke psychological and physical responses that tap into our own deeply entrenched relationships to colour.